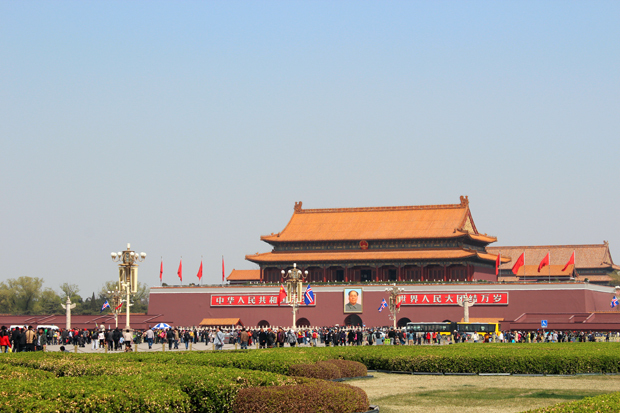 Tiananmen Square and the Forbidden City are two of the most important sights of Beijing and are probably on the schedule of every visitor who comes to the capital of China. 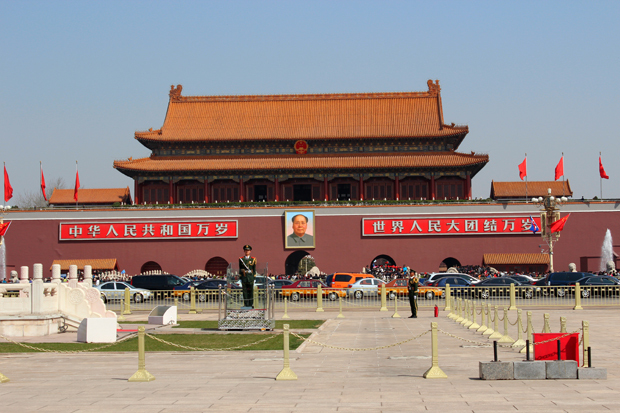 With about 40 hectare Tiananmen Square is one of the largest squares in the world and is named after the Tiananmen Gate (Gate of Heavenly Peace) located at its north end. 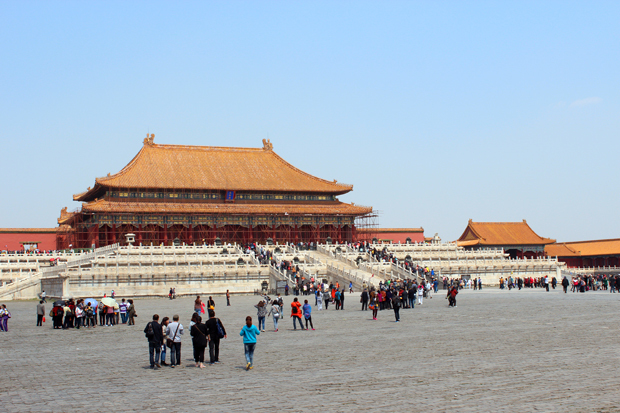 As I now enter Tiananmen Square and the Forbidden City, I am deeply impressed by its actual size, its vast expanses and the dimensions of the buildings which are more enormous than I have imagined. It is the 16th April 2013. Last night Leon offered us to join him for breakfast in an authentic chinese restaurant nearby our hotel. On the way back from the restaurant where we had our Beijing Duck dinner he showed us the breakfast place and suggested to meet there. Now I am walking along the busy Chongwenmen street. The restaurant is not far away from our hotel, but the way seems to be endless. I am walking and walking but I can’t find it. 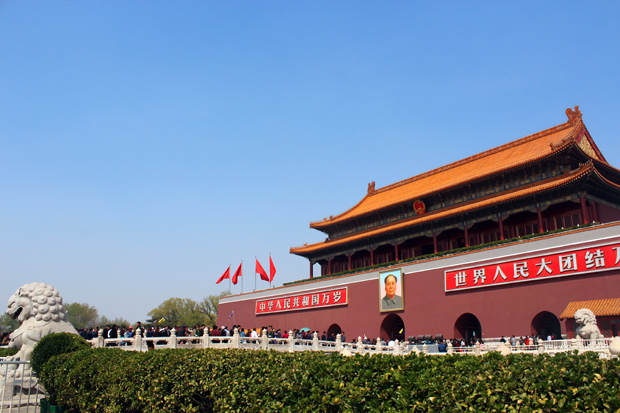 As I am running out of time I decide to go back and have at least a small breakfast nearby our hotel before discovering Tiananmen Square and the Forbidden City together with my group. McDonald’s seems to be a good option to me when not being accompanied by a chinese speaking person. It is westernized and the major part of the menu should be similar in many countries. What can go wrong at a McDonald’s? Nothing I think, not knowing how mistaken I am. After entering the restaurant I realize that the whole menu is only written in chinese characters, but at least it has pictures. I point on the photo of the menu I would like to order and try to explain to the staff that I would like to have orange juice instead of coffee. Neither he nor any of his colleagues speaks a word of English. Fortunately the man next to me does at least a little bit, so he explains my extra wish to the staff. When I am asked to pay I am wondering about the price which is higher than I have calculated. 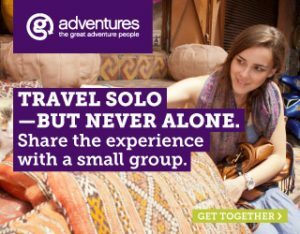 Apparently they have two prices, one for chinese people and another one for western expats and tourists, who obviously have to pay more. My breakfast is been served and I am staring on my tray. I haven’t ordered this enormous amount of food! Eventually I find out with the help of the man next to me that I have received my food twice, without coffee but with one orange juice! I suppose I must have pointed on the desired menu twice! This also explains the relatively high price I had to pay. As I can’t eat that much I ask to return one menu and without circumstances I get the differential amount of my money back, even though I haven’t asked for that. At 9 A.M. I meet my travelmates back in the hotel lobby. 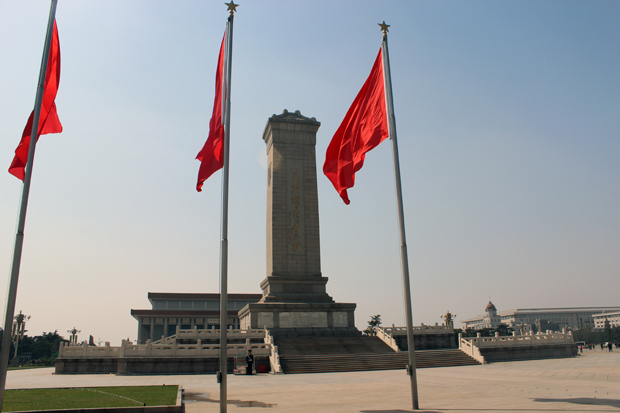 As the Tiananmen Square is less than 2.5 kilometres away, we take a walk there. On the way there Leon and I are walking alongside. We are talking about our respective studies at university which we have both completed a couple of years ago, about our families, about his life in Beijing and mine in Cologne. 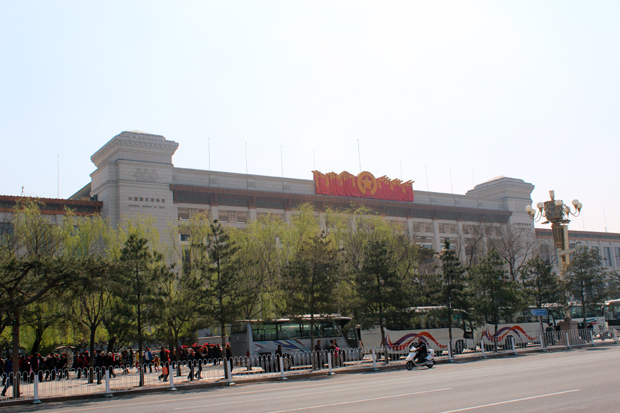 At Tiananmen Square our group has time to wander around by ourselves and take photographs of the square and its surrounding buildings. 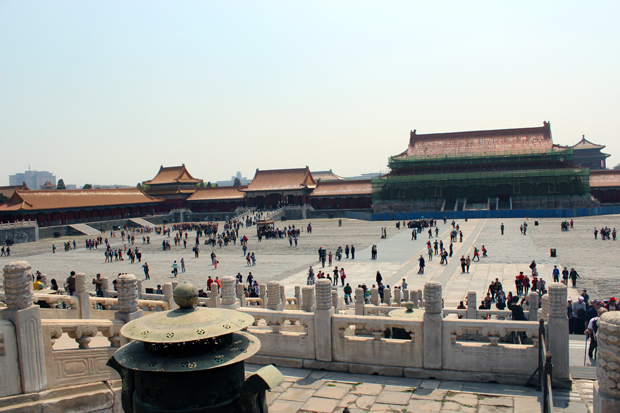 The Square was built in 1651 and has enlarged four times since then till receiving its actual size in the 1950s. 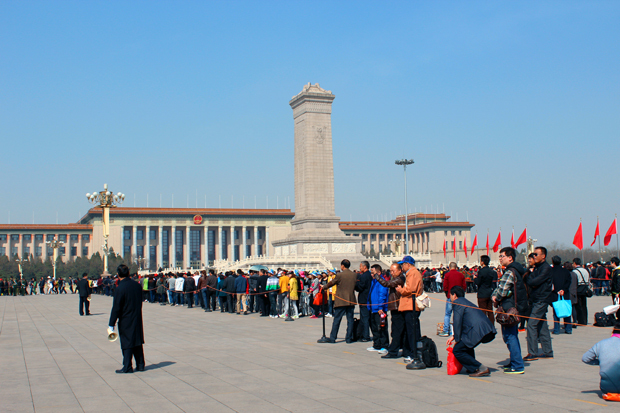 In the middle rises the 38-meter high Monument to the People’s Heroes and the Chairman Mao Memorial Hall south of it in whose front endless queues have formed, stretching over hundreds of metres across the square. 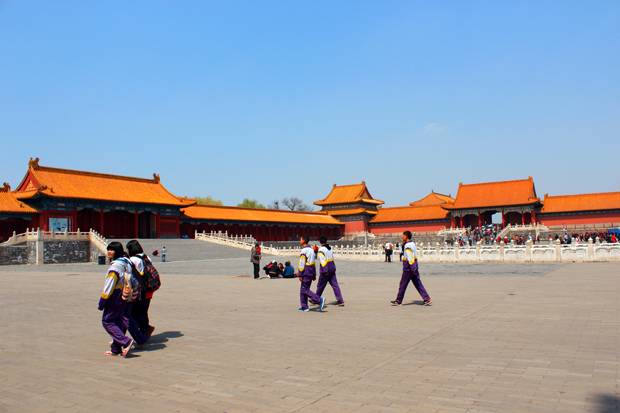 The Zhenyangmen Gate, also known as Qianmen Gate, marks the south end of the Square. 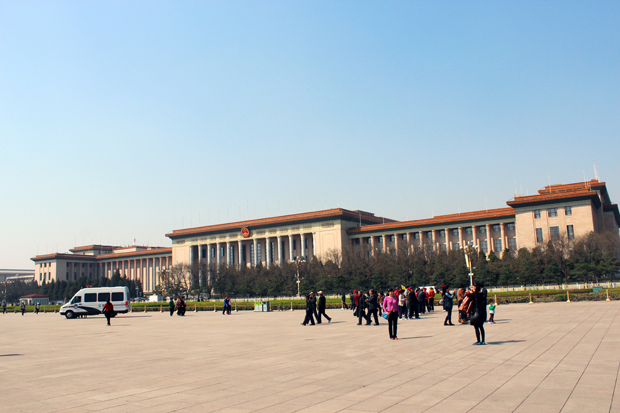 In the west Tiananmen Square is flanked by the Great Hall of the People and in the east by the Chinese National museum. 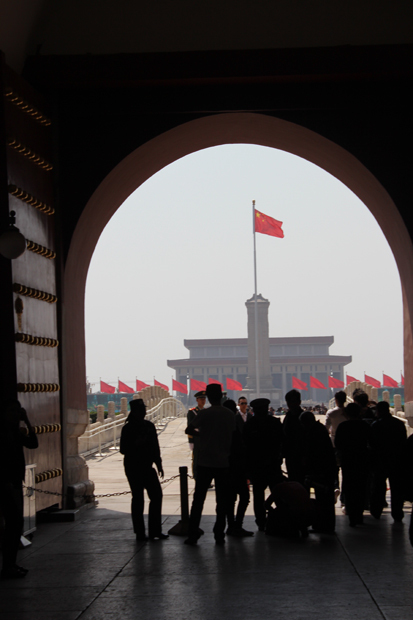 After a while we continue to the north end where Leon takes photos of our group in front of the Tiananmen Gate, the main entrance of the Forbidden City, which is just on the other side of the main road. 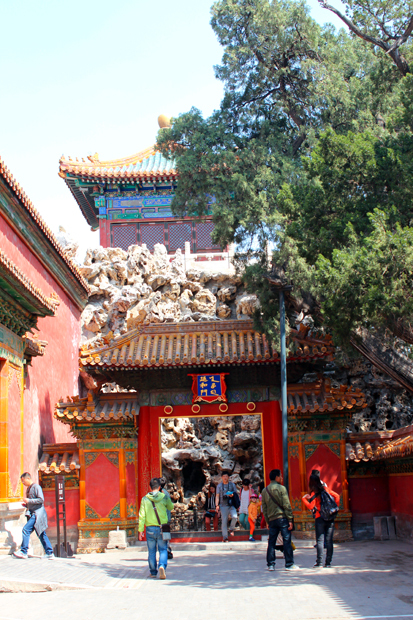 Afterwards we take the underpass to get to the Forbidden City. Carly, Vikki and David from the UK, Alexander from Denmark and I are walking together. 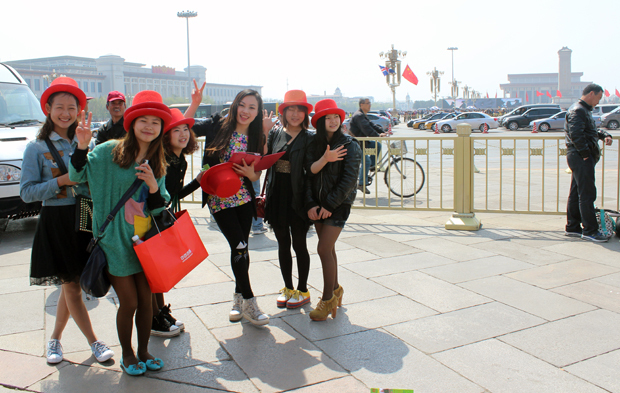 On the other side of the road, right in front of the Forbidden City, we encounter a group of young chinese female students who are really keen to take photos of themselves with Carly, Vikki and David. When facing Alexander, the tall danish guy, and me, the little blonde german female, they involve us into their photoshooting. It takes quite a while till every single one of them has taken a group shot with us. I wonder if we now become “international celebrities” in Beijinger student housings. 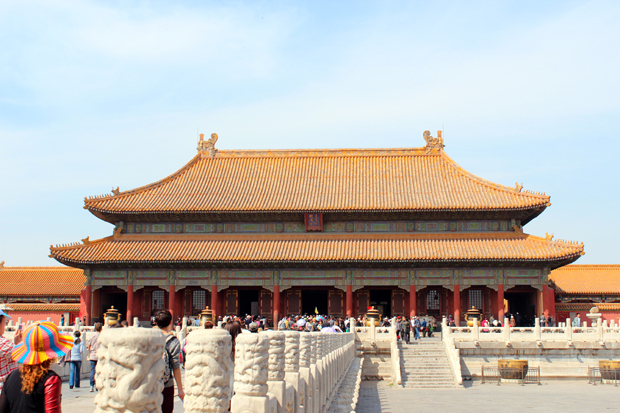 The Forbidden City was built between 1406 and 1421 by Emperor Yongle and over 500 years it served as a home for 24 Emperors of the Ming and Qing dynasty and 6000 members of their imperial household. 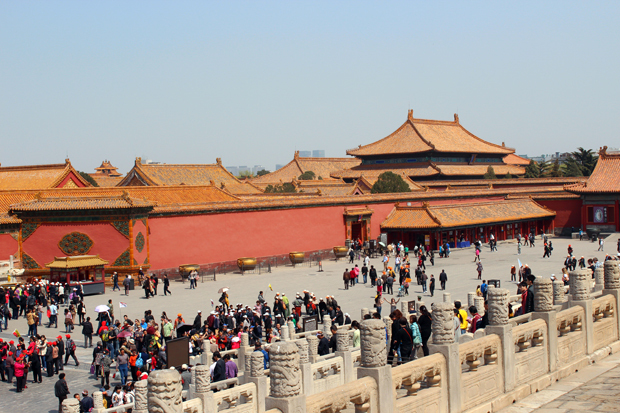 Civilians were refused to enter, why it is called Forbidden City. The palace was the center of the empire and the empire the center of the world. 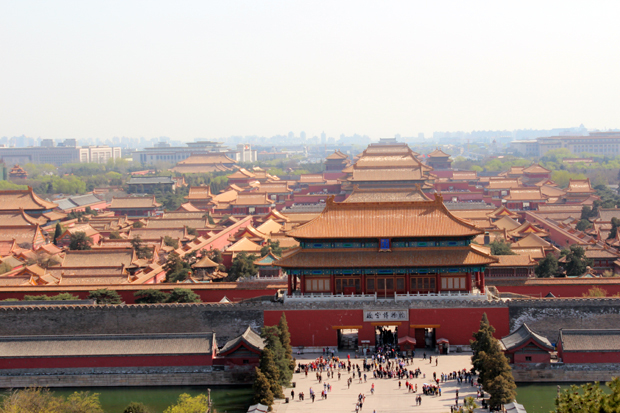 Also nowadays the Forbidden City is still located in the heart of Beijing. 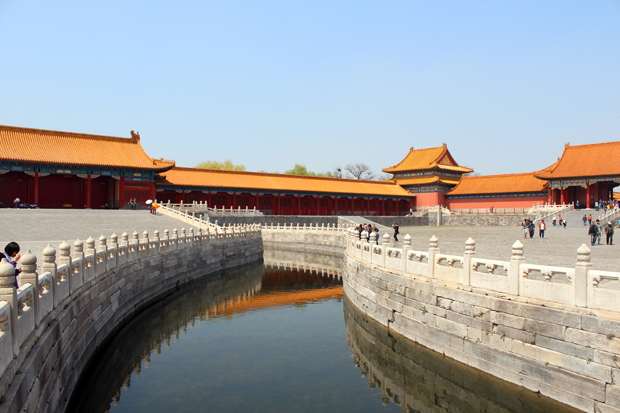 It is surrounded by a 7.9 metres high city wall and a moat 6 metres deep and 52 metres wide. Towers with ornated roofs sit at the four corners of the city wall. 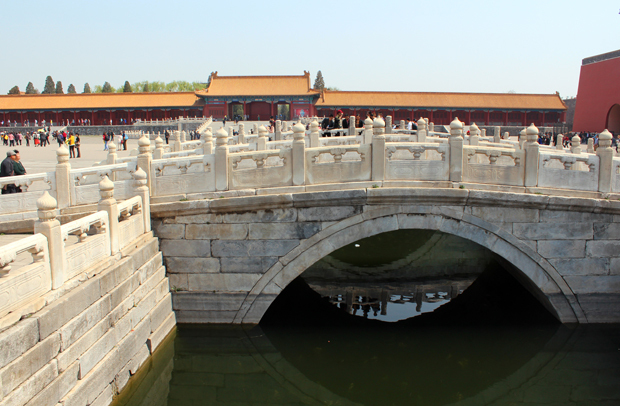 In the South five marble bridges lead over the moat onto the Tiananmen Gate from whose balustrade Chairman Mao has held his famous release speech on the 1st October 1949. The whole complex covers 720.000 square meters and is 961 metres long from north to south and 753 metres wide from east to west. 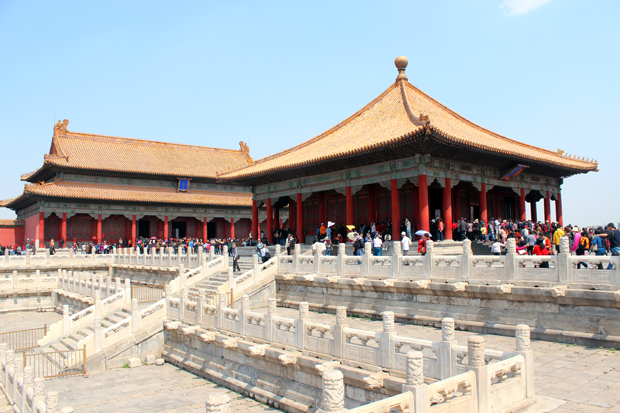 It has four entrances in the north, south, east and west, consists of 980 buildings with 9.999 rooms and is divided into an Outer (Wai Chao) and an Inner (Nei Ting) Court. 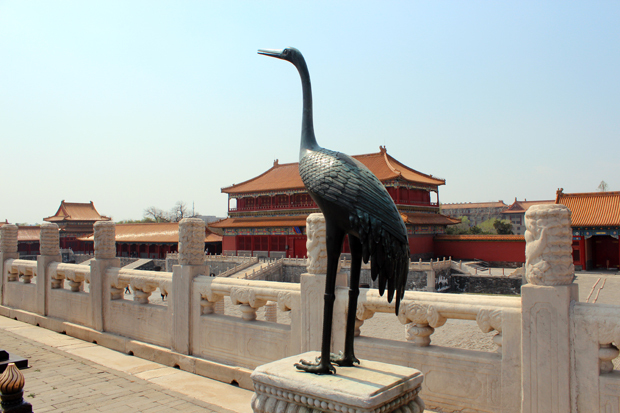 In 1987 the Forbidden City was declared a UNESCO World Heritage Site. 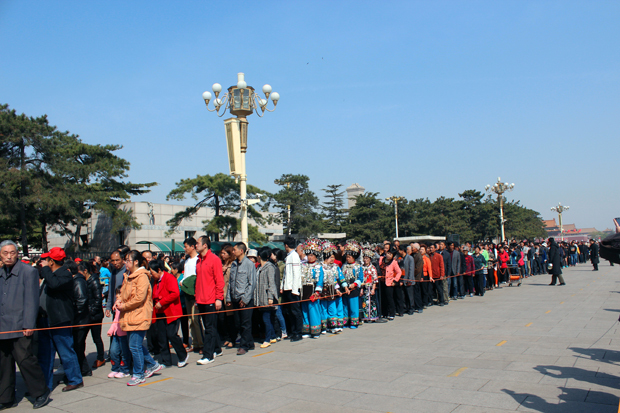 Through the Tiananmen Gate in the south, famous for its huge official Chairman Mao portrait at the front, we enter the Outer Court of the Forbidden City and walk along the sustained path onto the counters where hundreds of people are already waiting. Alexander and I are walking alongside, talking about his former job which he has done after finishing school, about his plans to start studying in Copenhagen in fall and about my job as a journalist. 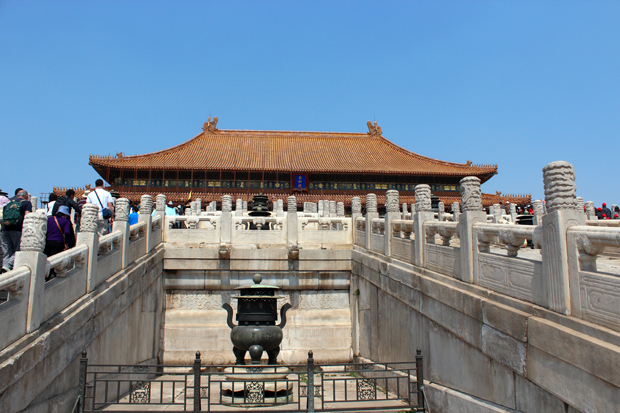 After Leon has bought the entrance tickets for our group, we cross the Meridian Gate (Wu Men) the southern and largest Gate, which marks the entrance to the actual Imperial Palace and former administrative area of the Emperors of that time. In front of us we encouter a huge square which is traversed by the meandering Inner Golden Water River (Jinshui He), crossed by five bridges. 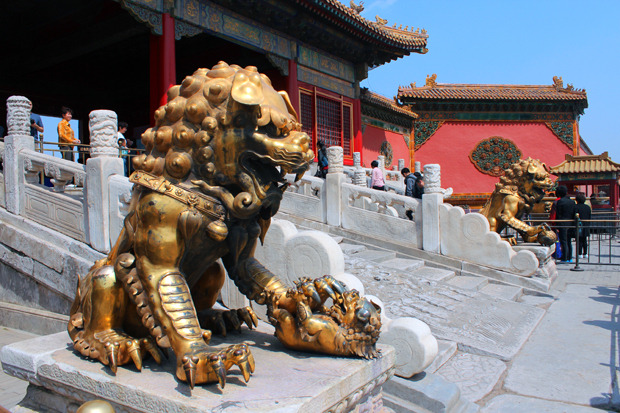 Beyond the square we face the Gate of Supreme Harmony (Taihe Men) which is guarded by pair of lions; the female lion on the left is restraining a cub lying on its back, and the male lion on the right is playing with a ball. 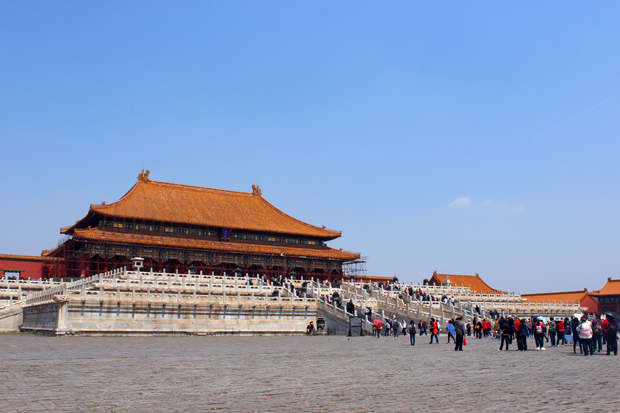 Behind that is the Hall of Supreme Harmony Square, another vast courtyard with a three-tiered white marble terrace rising from this square. 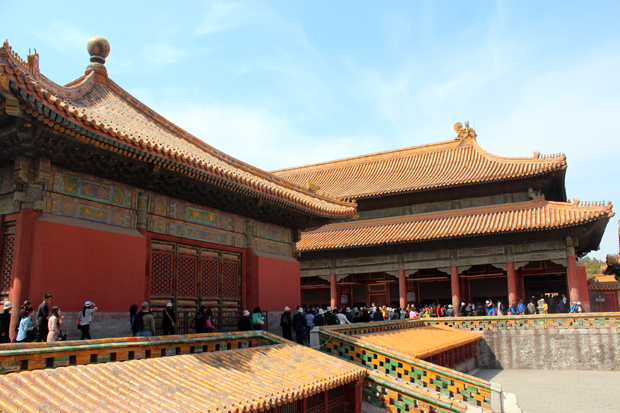 Three halls stand on top of this terrace, the heart of the imperial palace. Coming from the South these are the Hall of Supreme Harmony (Taihe Dian) which is 27 metres high, 64 metres wide and 37 metres deep and represented the ceremonial centre of imperial power. 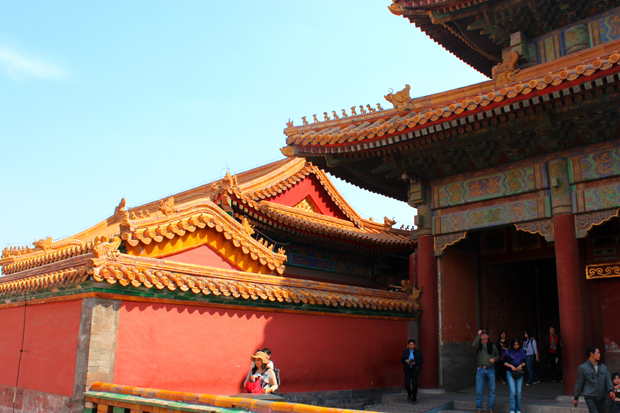 The Hall of Middle Harmony (Zhonghe Dian) is smaller and was used by the Emperor to prepare and rest before and during ceremonies. 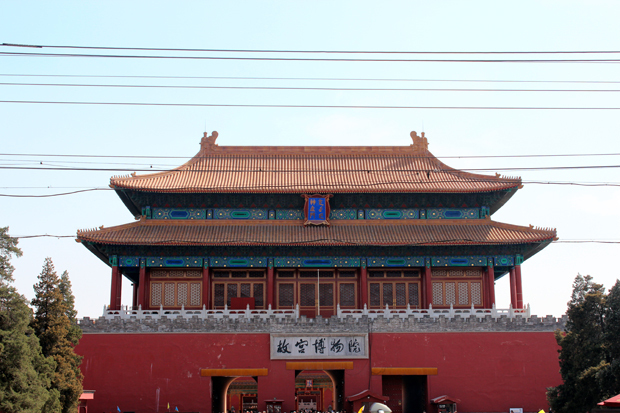 The Hall of Preserving Harmony (Baohe Dian) behind, was used for rehearsing ceremonies, and was also the site of the final stage of the imperial examination. 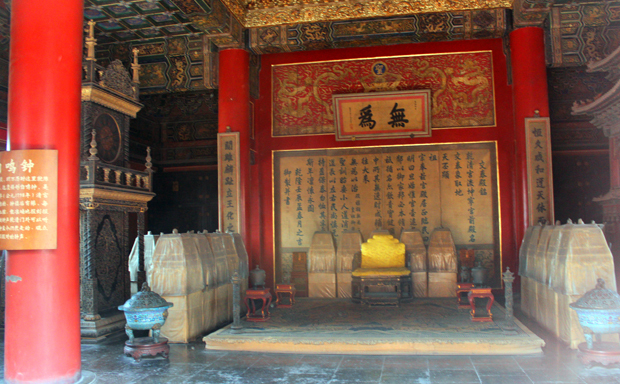 All three halls hold thrones; the largest and most artful one is inside the Hall of Supreme Harmony. 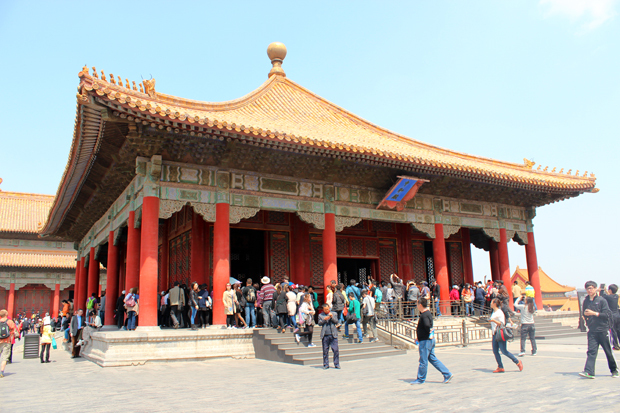 Through the Gate of Heavenly Purity (Qianqing Men) we enter the Inner Court and walk onto the Palace of Heavenly Purity (Qianqing Gong), the largest of the three halls of the Inner Court. 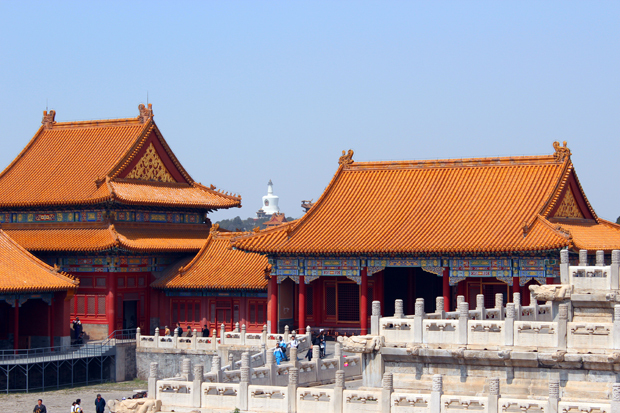 The other two are the Hall of Union (Jiaotian Dian) and the Palace of Earthly Tranquility (Kunning Gong), all also built on marble terraces. 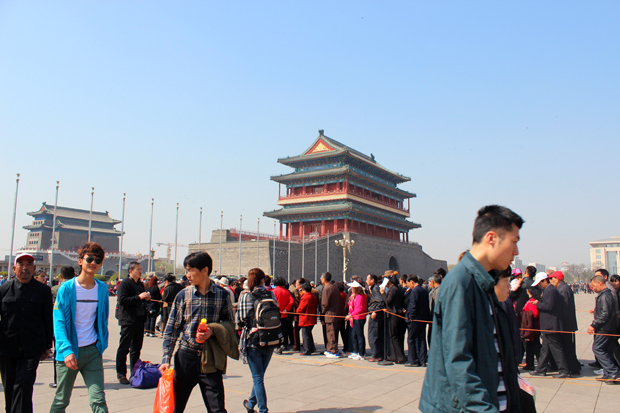 In front of all significant buildings crowds of people are trying to take a look into the inside. I manage to take at least a photo of the interior of the Hall of Union. 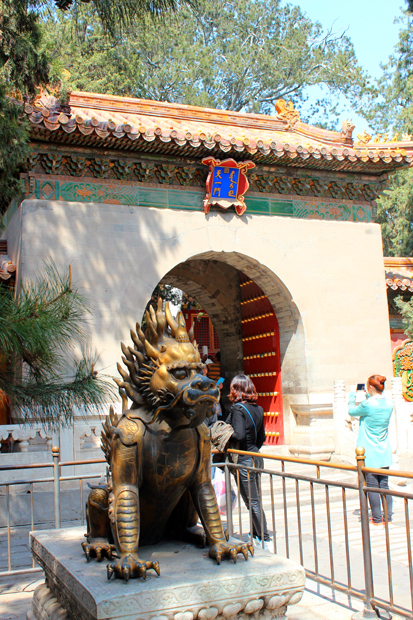 Through the Gate of Earthly Tranquility (Kunning Men) we leave the Inner Court und enter the Imperial Garden, in whose center the Hall of Imperial Peace (Qin’an Dian) stands. 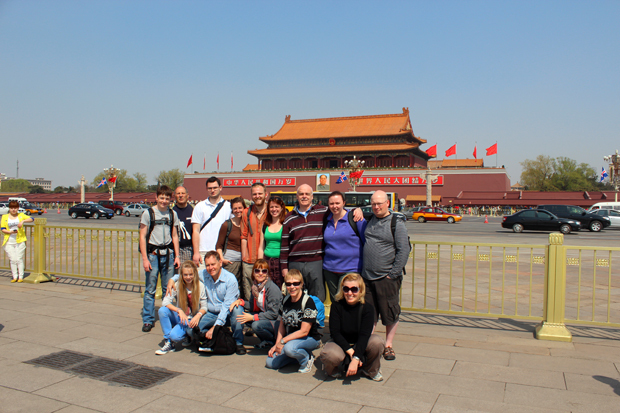 After we have finished our sightseeing tour, Vikki and David, the couple from England, and I say goodbye to our group. 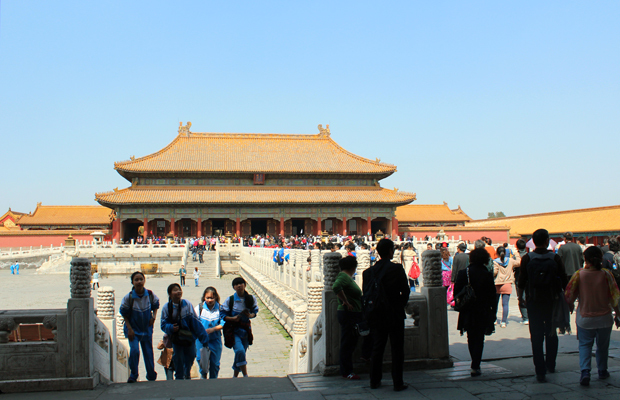 While Leon takes the rest of our travelmates to a local “snack market”, I am intending to make a more intense stroll through the Forbidden City to take further photos inside the complex. 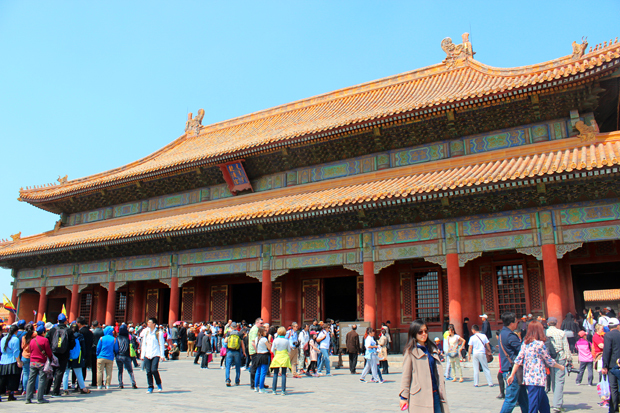 Therefore I take the whole way back to the Meridian Gate and repeat the same tour which we have done with our group. 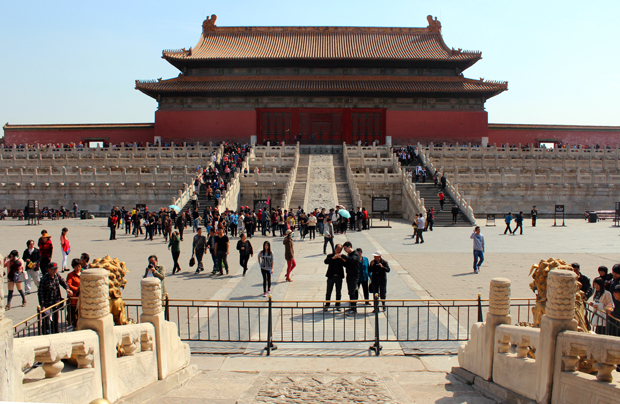 Once I have finished my photo tour I leave the Forbidden City through the Gate of Divine Might (Shenwu Men), the same way my travelmates have taken. 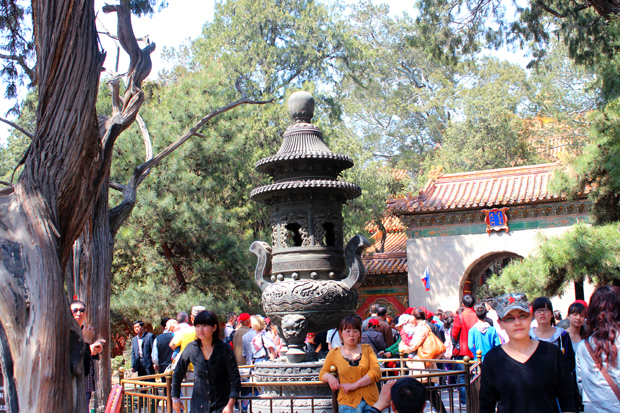 I enter the Jingshan Park on the other side of the road where I ascend the same titled hill, also called Coal hill. 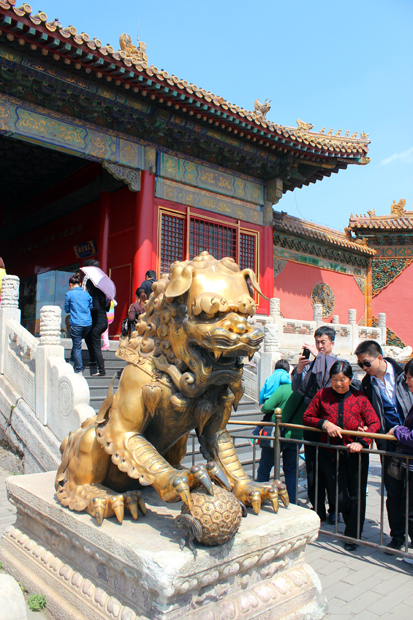 It is an artificial hill, which rises 45 metres above ground and is therefore also called “Prospect Hill” as it offers a fantastic view over the Forbidden City. Before coming to China I have done a lot of research about the country in general and Beijing in particular and I have also heard a lot about the so called Hutongs, the old quarters of the city, characterized through their narrow alleys and streets and their one-story courtyard houses where a pristine charm and a laid-back atmosphere are still appreciable and where the people are still living a traditional way of life. 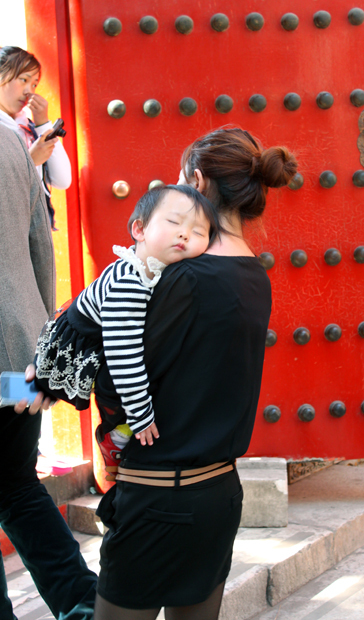 Hutongs can be found mainly in northern chinese cities, most prominently are those in Beijing. 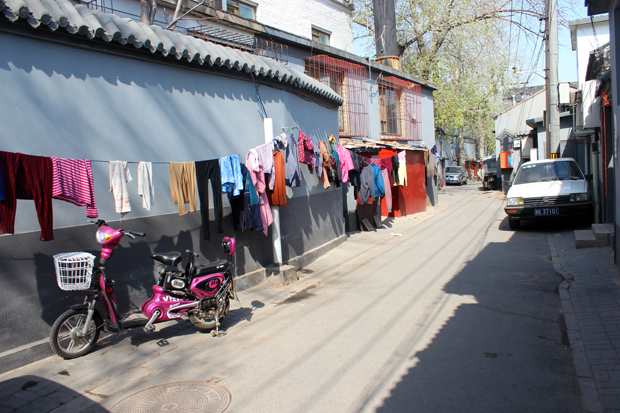 I had originally planned to do a Hutong on the day my tour started, together with another young female from the UK who is currently doing another tour with the same company, but due to unfavourable conditions we have missed each other. 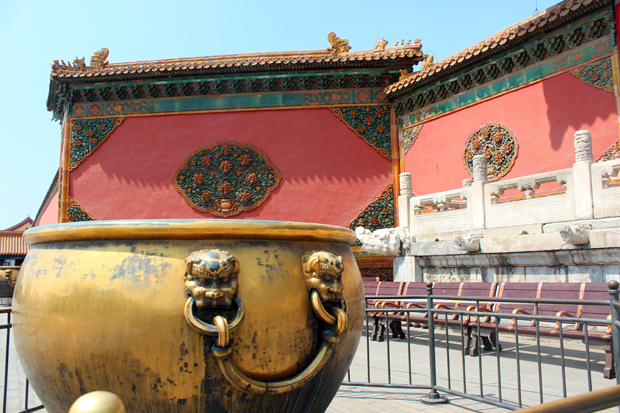 As I have run out of time I have visited the Lama temple instead which I would have normally discovered today. 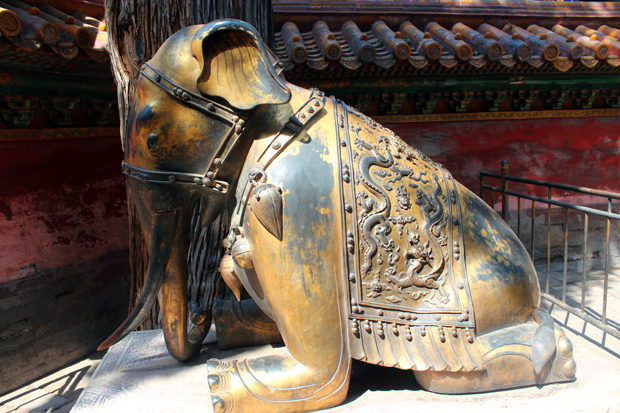 Hence after descending from the coal hill I am now taking a walk to a Hutong in the immediate neighbourhood of the Forbidden City. A totally different atmosphere receives me there. Time appear to play no role. 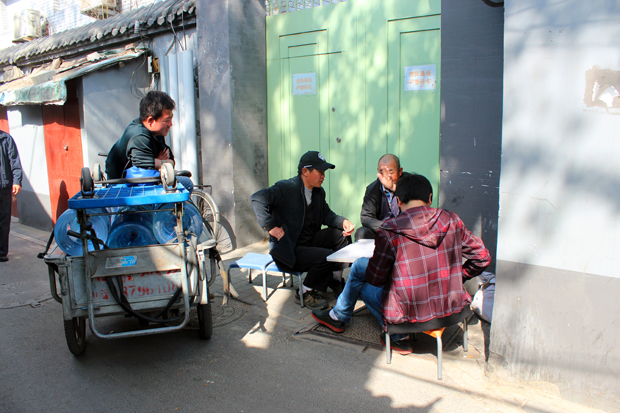 A group of of men is chatting and playing games in the street. 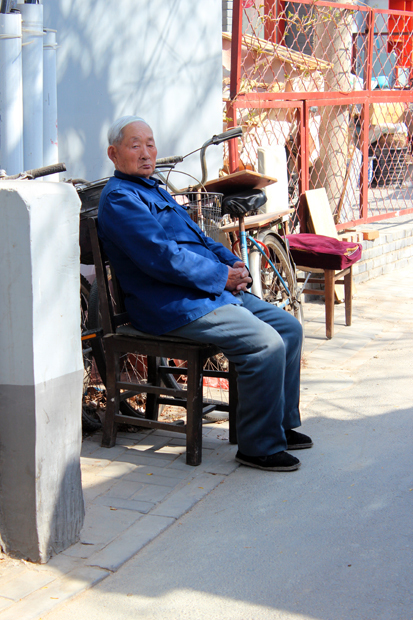 An elderly man is just sitting in another narrow alley and watching life go by. 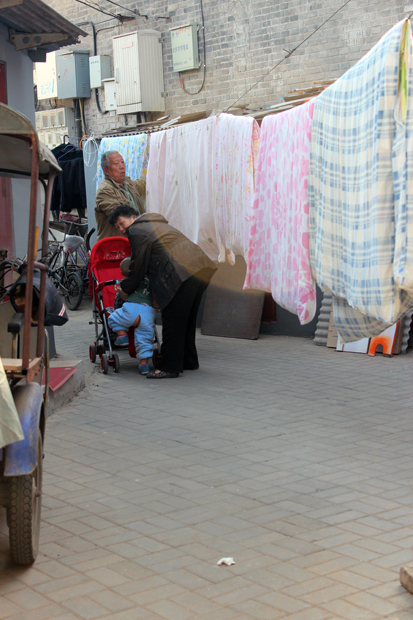 A couple with a little child are hanging out the laundry in the streets. Cars, Motorcycles and cycle rickshaws are just parked in the alleys and they even don’t seem to be locked. No one seems to be concerned that they could get stolen. 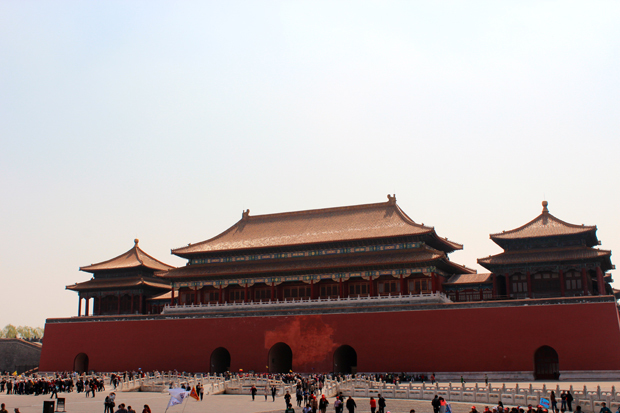 One feels to be in a whole nother world than in vibrant Beijing. 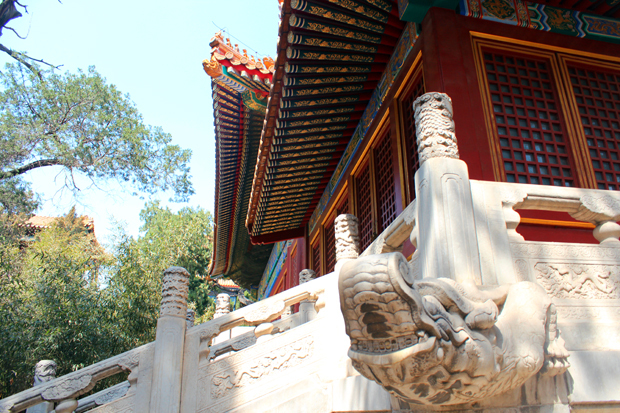 I have initially intended to stroll through the Hutong just by myself and get lost in the alleys like a canadian guy who I have met in the Summer Palace has recommended me, but I am feeling a bit like an intruder, so I choose to do it another way. 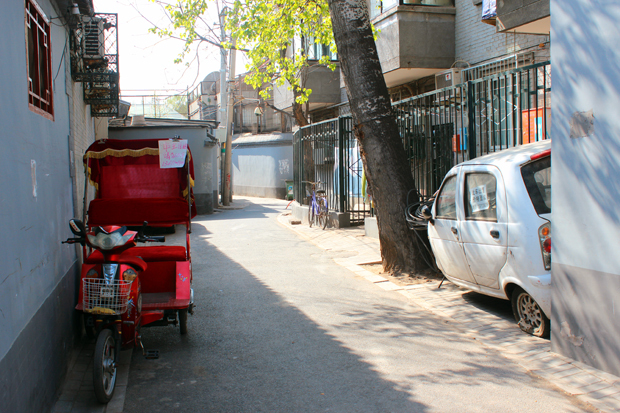 Talking to other guests in a courtyard café at the edge of the Hutong, I find out that most of them have done a Hutong tour by cycle rickshaw whose drivers have offered to take them around. 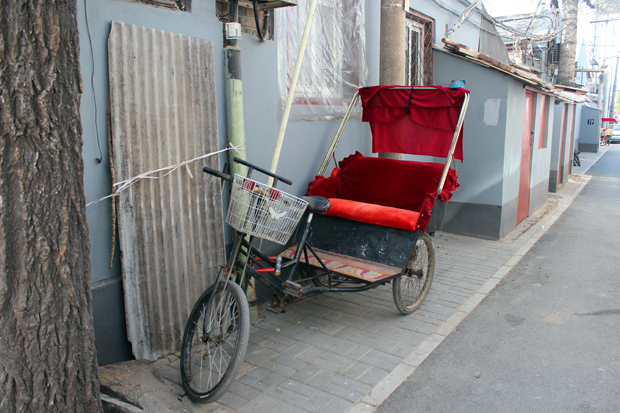 However, all cycle rickshaws I encounter, either have clients already or are parked and empty with no driver around. 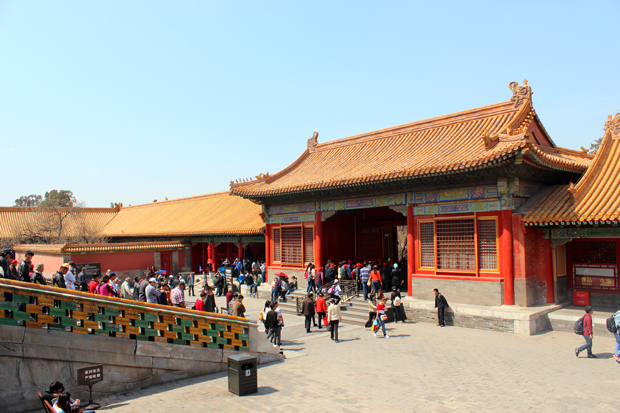 The owner of the courtyard café has told me anyway that the best hutong is located near the Bell and the Drum Tower and that many of those Rickshaw drivers near the Forbidden City are illegal. I decide to head back to the hotel to find Leon who can hopefully give me some tips which is the best way to take a Hutong tour and how much I would have to pay, as the informations I was given so far ranged from apparently very cheap to very expensive. Taking the public bus back to the hotel is again an adventure after my visit at McDonald’s this morning. Neither the bus driver nor any of the other passengers speak a word of English, but with my hotel business card plus with gestures and mimic I manage to ask the people to let me know when to get off and they gesticulate when we finally reach the bus stop close to my hotel. In the hotel I am bumping into Alexander and few others of my group. They tell me in detail about their visit to the local “snack market”, where scorpions, cocoons, spiders, starfish, seahorse et cetera are sold instead of chicken, beef, pork and vegetables. I have been a vegetarian between the age of 16 and 21 and I could not kill an animal myself. 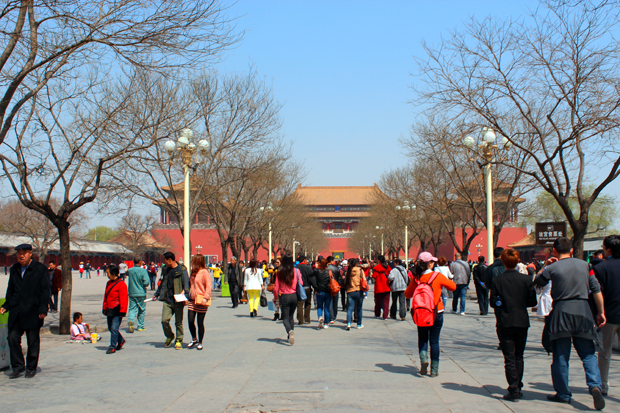 I am even struggling to kill a mosquito, but now I regret that I didn’t join my group for the visit, especially as Leon has told me earlier today that the “snack market” is something typical for this city what we will only face in Beijing on our trip. I have been to the Donganmen Night Market on the day of my arrival, but the stalls were closing when I got there and moreover, I guess a visit together with a group and a local guide would have been a more interesting experience. 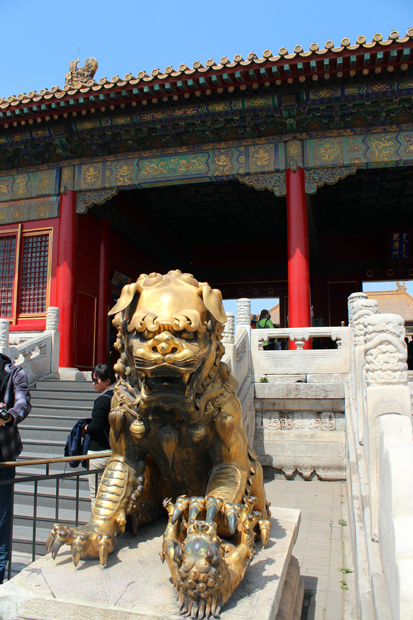 I also find Leon who offers me to meet him later again so that he can inquire about the Hutong tours. This isn’t something he is asked for very often, so he has to find out himself. 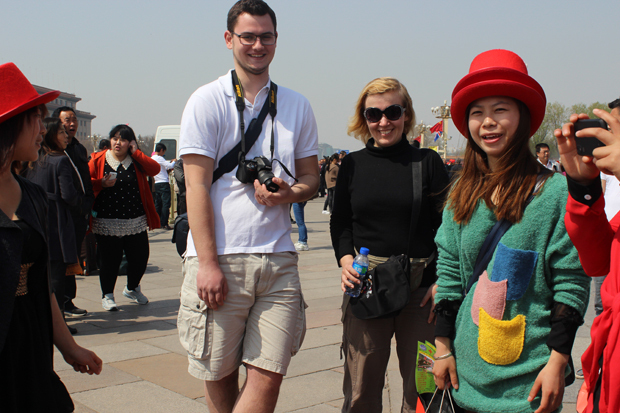 When we meet again about one hour later, Leon has done a comprehensive research about all different options of doing a Hutong tour. 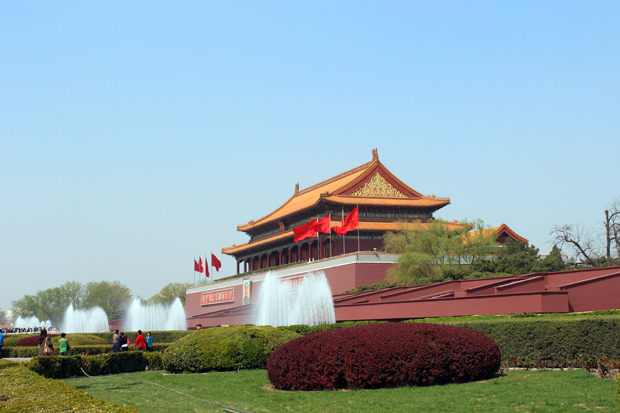 He recommends me to hire a cycle rickshaw close to the Bell Tower respectively in the Behai Park as those cycle rickshaw drivers should be trustworthy unlike those which offer their services close to Wangfujing Road, Tiananmen Square and the Forbidden City. He adds that a one hour tour by Cycle Rickshaw would cost me between 140 and 150 Yuan and that the price goes per Rickshaw. He notes which Metro lines I have to take to get there and where I have to change lines. 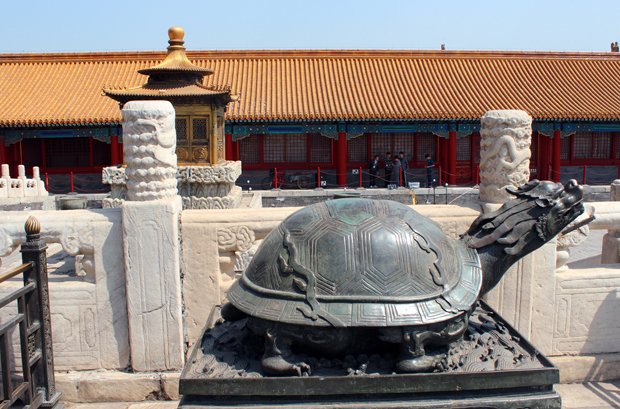 On my Beijing map he marks the way from the Metro station to the Bell Tower. 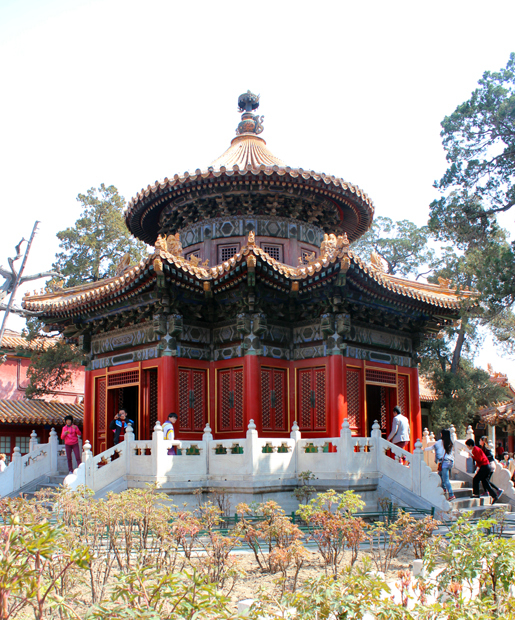 He suggests to do the Hutong tour tomorrow morning and gives me further tips what is worth to see in addition to those sights I have already been to. He also writes down in chinese characters how to order one of my favourite dishes for lunch tomorrow in a certain restaurant which I have found earlier today. In the hotel lobby I meet Alexander and Giorgio who try to encourage me to join them for the Kungfu show which they will attend tonight, but I want to save my money for the Shanghai Acrobats who, according to Leon, perform the best acrobatic show of the whole country. I am also chatting with Carly and Petra for a while who don’t have plans for tonight yet, so I offer them to join me for dinner at the Beijing Bookworm, where I want to go tonight, but they are tired. “The Beijing Bookworm” is a combination of restaurant, café, bookshop and library with numerous books of all categories, which I have discovered during my first days in the capital. 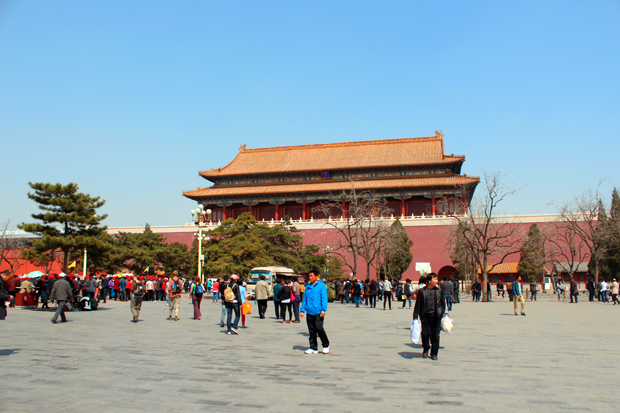 It is nothing typical for Beijing nor even chinese, but I really like the atmosphere, the food and drinks. 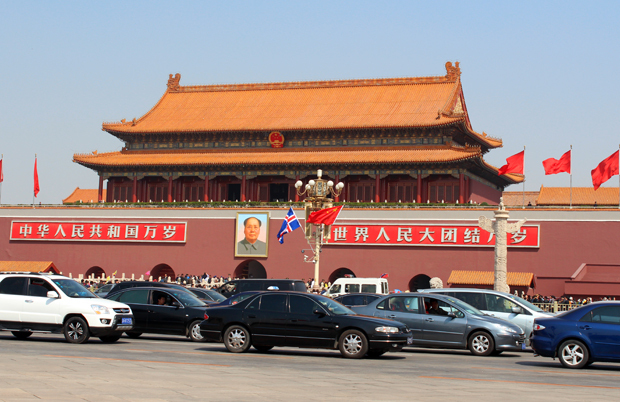 So I spend my last evening in Beijing on this trip there, before taking the metro back to our hotel.